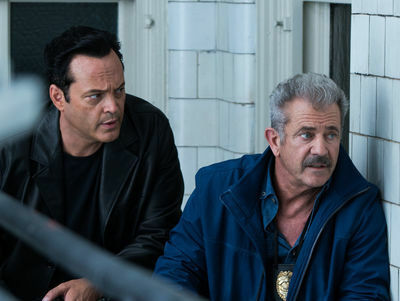 In “Dragged Across Concrete,” the new film from S. Craig Zahler, police detectives Brett Ridgeman (Mel Gibson) and Anthony Lurasetti (Vince Vaughn) cuff a suspect and apply a bit of excessive force in the apprehension; subsequently they’re both suspended from work sans pay. Brett’s wife is stricken by MS. Anthony wants to buy a ring to propose to his girlfriend. Their dual financial needs motivating them in their “violently earned” leisure time, as one character puts it later on, Brett and Anthony pick a criminal they know happens to be loaded and relieve him of his cash. At the same time, Henry (Tory Kittles), an ex-con fresh out of prison, short on funds but rich in woes, reluctantly takes a gig with the same criminal the cops want to rip off. It’s a Zahler movie, so everything ends in tears and no small amount of blood is spilled. “Dragged Across Concrete” is in many ways his most ambitious film to date, epic in the way great classic crime fiction can be while also zoomed in on threads that at a distance might read as trivial. Each minute of its 158-minute running time is as engrossing and absorptive as the last, which is the effect of writing characters who speak like they’re in a David Milch production. But “Dragged Across Concrete” runs on human desperation, the common element binding together racist cops and marginalized people simply trying to make life better for themselves. Motivations do vary across characters, but the fuel driving them is universal. In a conversation with RogerEbert.com, Zahler talked about that drive as a result of his specific writing process rather than the product of top-down aesthetics, as well as the consequences casting an actor with Gibson’s notoriety can have on a movie’s story and visibility. I feel like in a lot of ways, this movie reflects Gibson as a person, and really I’m wondering if that’s why you wanted him to be in the movie in the first place? Did this have to be Mel’s role, for you? No. 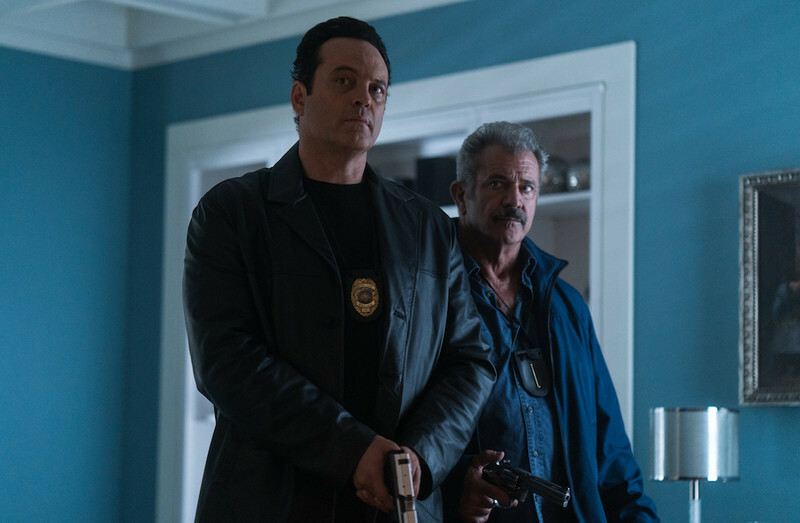 The way this came about was, I finished the script maybe two weeks before I met Vince [Vaughn] when he came on board “Brawl in Cell Block 99.” So, when I'd initially written it, it was for a 30-year-old and a 50-year-old, and actually Anthony Lurasetti was supposed to be notably short. And that was my original conception of it. I had a great working experience with Vince Vaughn on “Brawl in Cell Block 99”; I was blown away by his range, I enjoyed working with him—he’s a funny guy on the set and in real life, which is a surprise to nobody—and when we got towards the end of that piece I started thinking about him for Anthony Lurasetti, reimagined as a bigger, slightly more menacing guy than I had originally seen it. But I knew that he could pull it off. And actually coincidentally his middle name is Anthony, as a good deal of his heritage is Italian. So I offered him the role, and then when I started thinking about who is going to seem to be a match for him on screen, and who also will seem like a senior person who is further down the road in the career, Mel Gibson was one of the first people I thought of, and Vince already had a relationship with him. So it was really from the root of working with Vince, having that relationship with him, putting him in the role of Anthony, and then thinking who would fit as a senior guy, and a more grizzled guy, and have a comparable amount of charisma up on the screen. So no, when I wrote this, neither of these people were people I had in mind, though in general, and specifically in this case, I don't have actors in mind when I'm writing roles. I try and avoid that. Occasionally Fred Melamed sneaks in there; he's been in all three of my movies, and even before I knew who he was, I was writing characters that were similar to him. That's how it went about, and Vince obviously had the pre-existing relationship with Mel from “Hacksaw Ridge,” and facilitated that submission. Mel read it and said a lot of complimentary things; I spoke to him, and he was on board, and that was how it came about. Circling in my mind is his public notoriety, notably during ... the first 20 minutes of the film where they're pining for the good old days. That's fascinating because you have such a complicated figure with Mel in the movie. Was it easy for you to work with that, to have him folded into the movie, because it’s about such complicated figures on its own? We shot the script as I wrote it. I didn't change anything other than the age of the characters when I cast it. That again is the pre-existing script, and obviously there's the stuff that you're mentioning where it kind of overlaps some stuff that people might be bringing into the theater, which is, you know, a consequence of that casting choice. But I wasn’t going to change the material or change the characters that I wrote because of the stuff going on in their personal lives, just like I'm not really interested in discussing their personal lives. I just don't know that much about it, I mean. He was good to work with, and he came on board and delivered what I wrote and brought up a lot to the role. To quote him, he's a good soldier, and he came in and did his work. My directing style is obviously extremely different from his, and he was always comfortable with letting me do what I wanted to do, showing up as a performer, and delivering the goods. So those complications are really immaterial; what you're looking for is somebody who can take your creation and make it work on screen? Yeah, exactly. I put him in the role because I thought he would be fantastic for the part— and he is fantastic! You used the word “consequence” a few moments ago. Is there a point where you consider that there may be consequences for the movie from him being in it? This is something that’s spoken to in the movie, but it’s kind of the time that we live in right now. I want to make the best movie possible, and I put him in the role because he's fantastic. I mean, there are a couple of consequences of putting him in the movie; one is you and I are having this conversation, and the major part of your interview time is going to be spent discussing it. And there are also people who won't see the movie because of that casting choice. But I have a target with what I do, and the target is the best version of the movie possible. Once I put Vince with someone with that stature and that charisma and that presence in that role, and I needed a senior guy who could hold his own and seem legitimately his superior in some ways, his equal in others, of the same breed but further down the line and more embittered, he was the choice for me. So I make a lot of choices that aren't going to make the movie the most popular for everybody, but everything that I do will appeal to only a certain amount of people. Appealing to the largest group, or going after the biggest demographic, has never been a concern of mine. It's just not what I do. I would not write “Bone Tomahawk,” and “Brawl in Cell Block 99,” and “Dragged Across Concrete,” nor the violent Western novels I've written, or any of this stuff if I was chasing a big audience. I'm chasing self-satisfaction, and I hope that enough people enjoy it that it’s successful enough that I get to make the next one. I actually think the casting plays very well with what the movie is trying to accomplish, and I'm curious about the movie's layers of racism and how people—white characters, black characters—interact with each other throughout. Is this something that came to you after taking the temperature of the moment that we're living in? It feels like a very of-the- moment movie. You're not the only person who’s said it’s very of the moment. I conceived of it in 2015; we had a very different president, and it was a very different moment. This comes from my interest in building a larger world and showing different people with different plights from different backgrounds and how they converge: Kelly Summer, Jennifer Carpenter's character, and Melanie Ridgeman, Laurie Holden's character, Tori Kittel, Mel Gibson, Vince Vaughn, these are all different people with different histories. A lot of what I'm interested in doing in my novels and music and movies is world building. If you're painting with a lot of a lot of different colors, and using a lot of different strokes, and going on a wider canvas, the world will be richer. Not every piece calls for that; my first [movie], “Bone Tomahawk,” was an ensemble piece, and I feel you got a lot more different viewpoints than that. And then the second one wasn't. “Brawl in Cell Block 99” is really driven by a guy, and there are the people around him, so it's a little bit more singular that way. The world-building in that is more specific to the environments, particularly the prisons. In this one, showing all these different facets of society in the fictional town of Bulwark, gives you a larger world that is unique to the movie and something to take away in addition to the story and what happened to the characters. There's an environment, and there's a sense of place, which is also something that gets lost if a movie just gets whittled down to 2 hours or 90 minutes. That sense of place and space, and the feeling like you're in the environment and inhabiting the environment. So that's that's a lot of my interest in exploring a lot of that stuff. But certainly in terms of your comment of it being of the moment, if you're writing from the viewpoint of all the characters which I do—I mean, if I'm writing a scene with Henry Johns [Tory Kittles] and Biscuit [Michael Jai White], I'm thinking about where they're coming from, why they're doing what they're doing, and the same with Anthony and Ridgeman. So if you're writing from their viewpoints for their sequences, and then you bring them all together, ideally you have a complicated conflict and you have a rich world. What really struck me is that you've woven all these different stories from different perspectives together, and the thing that binds them all as far as I see it is need; everybody here has the same pressing driving need. And then ultimately the film becomes about whose need is greater, who deserves it more. Was that the intention you had when you when you began writing, to create a space for that need to foment? I don't come at a piece with any larger thematic ideas, any agenda, any thesis statement that I want everything in support of. I write from the characters’ points of view and inhabit them. What you're talking about in terms of the need and that being there very much comes from that I want all of these characters and their goals to be clear. I don't get the question from actors almost ever, or maybe ever—I can't recall an instance on any of these movies where they asked me what their motivation is. They know why they're doing what they're doing, and the audience knows why they're doing what they're doing. So I come from a place where I want to get that in the movie, so there are limits on the time. For me it's shorthand—considering the length of this movie for a lot of people it isn't shorthand—but I just want them driven, and to have purpose and goals that are identifiable. Certainly there are going to be people who see the movie and like some of the characters, who dislike some of the characters, who dislike most of the characters or all of them, or the other way around. So you understand why they're doing what they're doing, and then in terms of what you bring in terms of your own outlook, you can land in the camp of wanting group A to win, or group B to win, or want group A and B both to win or wanting everyone to lose. All of that comes from writing from the perspective of the characters and thinking about what those characters desire rather than there's a larger thematic point that I'm trying to underline, which a lot of times for me makes movies didactic if not pedantic and sort of makes the character subservient to the plot rather than the other way around, which is the way that I like to write.